Here comes the new BHEL Career making for all fresher Indian candidates who are looking for the jobs under Government sector. There are total 250 vacancies which are going to be filled up through this BHEL Recruitment process 2018. The completed Advertisement from which we took this information is in HINDI language only. So we translate that official notification in English Language over here. We also share the official link under IMPORTANT LINK Section. So those who understand HINDI language can also check that official Notification. More information related to this BEHL Recruitment process is given below in this article. 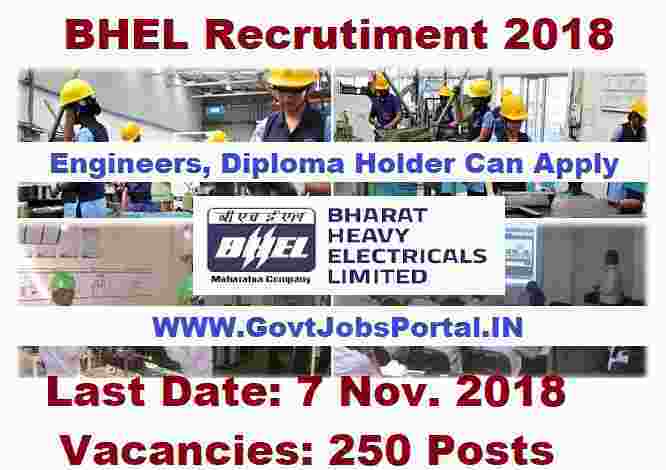 Read the whole post carefully before applying for this BHEL Career making opportunity 2018. 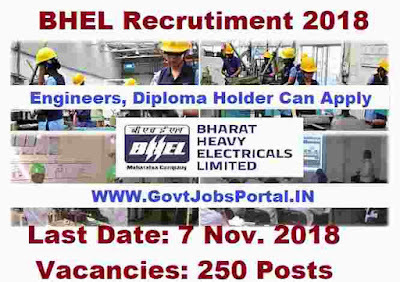 Applicants having B.E./B.Tech degree in relevant Branch can apply for this BHEL Recruitment process 2018..
Students who have a Diploma in related Branch can apply for these job profile under this BHEL Recruitment process. Age Bond: Applicants who are wishing to apply for this BHEL Career making opportunity must have age in between 18 years to 27 years. Same age criteria for both job profile under this BHEL Recruitment procedure. Candidates need not to pay any fee for applying these Government jobs under BHEL department. These online application for all Indian candidates are for free of cost. 22ND Oct. 2018 is the Opening Date to apply. 7th Nov. 2018 is the Last Date to apply.